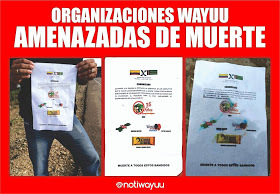 We have received news of renewed death threats against our friends in The Wayuu Women’s Force – Fuerza de Mujeres Wayuu-Sütsüin Jiyeyuu Wayuu (FMW-SJW). FMW-SJW are among the more prominent critics of Cerrejon Coal (owned by London-listed multinationals Anglo American, BHP and Glencore). They report receiving threats from notorious paramilitary organisation Águilas Negras (Black Eagles) for “hindering the development of the country” – a coded reference to objecting to mining and other large-scale economic projects. The original denunciation of the threats is in Spanish on the FMW-SJW website. At the FMW-SJW, we claim as our fundamental principle the defence of Wounmainkat – Our Earth, Winkat – water and Kataa o’ui – life. The women, men and Wayuu authorities that make up the Wayuu Women’s Force movement – Sütsüin Jiyeyuu Wayuu (FMW-SJW), express our absolute rejection of the threats against the organizational processes that defend human rights, women’s rights, indigenous peoples and the rights of Wounmainkat – Nuestra Tierra, in the Wayuu territory of La Guajira in Colombia. We denounce the renewed strategy of persecution and intimidation deployed by the armed paramilitary groups reorganized in the “Águilas Negras” [Black Eagles], who through leaflets scattered along the Cerrejón railroad, have threatened to kill those who defend life in the territory. We strongly condemn this fact that is deployed by the enemies of peace, just two days from the visit of President Iván Duque Marquez to Uribia, the Indigenous Capital of Colombia. It should be mentioned that, since its inception more than thirteen years ago, the FMW-SJW has been the object of misogynistic and hate-generating campaigns against us; we have also been subject to death threats, constant accusations and persecution that have forced several people from our movement to move outside the territory. We consider these threats a provocation to impede the peace that we have helped to build from our struggles. Due to the above, the FMW-SJW holds the Colombian State responsible for the acts that may threaten the lives of the Wayuu leaders of organizations that have been threatened with death. We request the Inter-American Commission on Human Rights to immediately and urgently evaluate, grant precautionary measures to the Movimiento Fuerza de Mujeres Wayuu – Sütsüin Jiyeyuu Wayuu so that we can continue with our work for the defense of Wounmainkat – Our Earth, Winkat – water and Kataa o’ui – life. It is necessary to mention and bear in mind that in the past, leaders of the FMW-SJW have been sheltered with the granting of these measures and they have had to leave the country because of the risks to their lives. We ask the current government to initiate an immediate action plan to guarantee compliance with the jurisprudence issued by the Constitutional Court in favour of the indigenous peoples to prevent the extermination of our peoples because of the war. In addition, we ask that priority be given to the situation of serious risk in which we find ourselves, in order to protect our lives. We call on the Missions and Diplomatic Corps accredited in Colombia to monitor the delicate and vulnerable situation in which we are the human rights defenders of the Wayuu People. We also request that they demand that the current government comply with the Peace Agreements, as well as with the commitments undertaken at the international level in the area of ​​human rights, especially those that have to do with the rights of indigenous peoples and human rights defenders. We urge the National Protection Unit (UNP) to re-evaluate the measures of the protection plan of the FMW-SJW as well as to reinforce the protection strategies from a holistic vision, which contemplates spiritual protection as part of the programme that allows us to guarantee not only work in our territory, but also the protection of life.